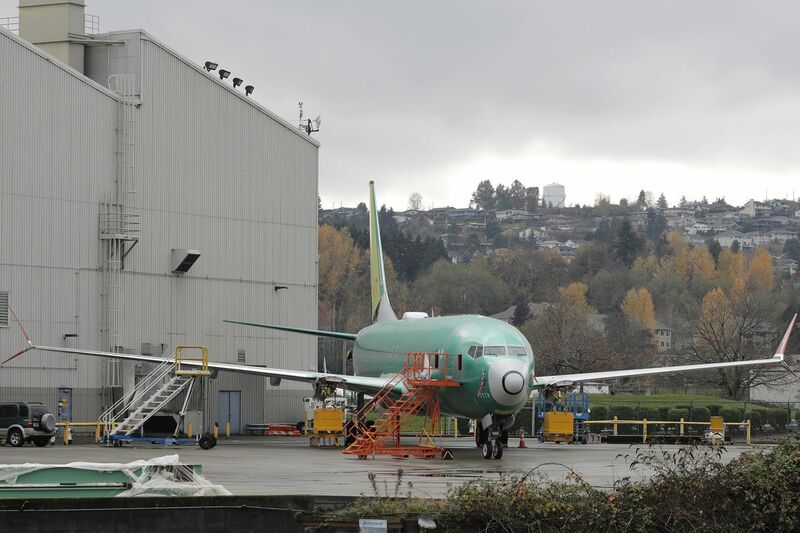 A Boeing 737-MAX 8 is parked outside Boeing Co.'s 737 assembly facility in Renton, Wash.
“Pilots have been notified, airlines have been all notified. Airlines are agreeing with this. The safety of the American people and all people is our paramount concern,” Trump told reporters. The Federal Aviation Administration said the grounding will be in effect while the investigation unfolds, but did not offer a timetable for how long the planes may be prevented from flying. The move follows a crash that killed 157 people in Ethiopia Sunday, the second recent deadly crash involving a Max 8 jet. An investigation by The Dallas Morning News found that, in the months before the crash, pilots repeatedly voiced concerns to federal authorities about the safety of the planes, from automation features to the “inadequate and almost criminally insufficient” flight manuals of the aircrafts. Citing potential connections between Sunday’s crash in Ethiopia and the October crash of a flight from Indonesia as a reason for the directive, the FAA’s order grounding Boeing 737 Max 8 and Max 9 planes prohibits the operations of the airplanes by U.S. operators and in U.S. airspace until further notice. On Wednesday, the order said, the investigation of the Ethiopia crash “developed new information from the wreckage concerning the aircraft’s configuration just after takeoff that, taken together with newly refined data from the satellite-based tracking of the aircraft’s flight path, indicates some similarities” between the tragedy and the Lion Air flight that crashed minutes after taking off from Indonesia in October. Southwest Airlines, the U.S. carrier with the largest fleet of 737 Max 8 jets, announced Wednesday it would immediately remove its 34 Max aircrafts from service. “While we remain confident in the MAX 8 after completing more than 88,000 flight hours accrued over 41,000 flights, we support the actions of the FAA and other regulatory agencies and governments across the globe that have asked for further review of the data – including information from the flight data recorder – related to the recent accident involving the MAX 8,” Southwest said in a statement. The carrier said it would offer “flexible rebooking policies,” and that any customer booked on a canceled Max 8 flight can rebook on an alternate flight within 14 days of their original date of travel without additional fees. From Tuesday evening through early Wednesday afternoon, four Southwest Airlines flights scheduled to land or depart from Philadelphia International Airport using Boeing 737 Max 8 jetliners were flown using different Boeing planes. Prior to the president’s announcement, a 737 Max 8 plane, Southwest flight 1029, had been slated to land in Philadelphia from Tampa at 5:40 p.m. Wednesday. The flight is now delayed by about an hour, according to the Philadelphia International Airport’s website. American Airlines, which has 24 Max 737 jets in its fleet, also said it is working to rebook any customers affected by the emergency order as quickly as possible. Speaking to reporters Wednesday, Trump said any Boeing 737 Max 8 or 9 plane currently in flight will continue to its destination before being grounded “until further notice." A map from Flight Radar 24 showed around three dozen Max 8 and 9 planes in the air at the time of the announcement. The FAA offered this explanation of its decision to reverse course and ground the Max 8 and 9 planes: "The agency made this decision as a result of the data gathering process and new evidence collected at the site and analyzed today. This evidence, together with newly refined satellite data available to FAA this morning, led to this decision. Boeing continues to have “full confidence in the 737 MAX,” but agreeing to temporarily ground its planes as a “proactive step out of an abundance of caution,” the company said in a statement. “On behalf of the entire Boeing team, we extend our deepest sympathies to the families and loved ones of those who have lost their lives in these two tragic accidents,” Boeing president and CEO Dennis Muilenburg said. On Wednesday morning, Canada’s transportation minister grounded all Boeing 737 Max 8 flights, leaving the United States and its airline carriers as the last major users of the jets. The transportation minister attributed the decision to newly available information linking similarities between Sunday’s fatal Ethiopian Airlines jet crash and an October Lion Air crash in Indonesia, in which 189 passengers and crew died. China, much of Europe, India, Egypt, Uzbekistan, Turkey, and Hong Kong have also banned the jets from their airspace. Earlier Wednesday, despite the growing worldwide contingent banning the planes, the Federal Aviation Administration insisted it has “no basis” to keep the aircraft from flying. “In the course of our urgent review of data on the Ethiopian Airlines Flight 302 crash, if any issues affecting the continued airworthiness of the aircraft are identified, the FAA will take immediate and appropriate action,” the administration wrote in a statement.